Digital marketing loses against traditional interaction with HCPs says Cegedim Strategic Data (CSD). According to the study called Global Promotions Audit, traditional interactions are still much more common and more efficient in impact on prescription behavior. To be honest, such a result is completely against what we preach at K-message. Digital tactics are supposed to reach wider audience, and properly executed can change behavior efficiently. What is more, we know that efficiency of digital can be measured. CSD’s study, at the first sight, says otherwise. Why is that? CSD collects data from physicians in Top 5 EU, USA, Japan, Brazil, Russia, China, Belgium, Canada and Poland. The research is part of syndicated panel, and respondents are physicians from primary and secondary care disciplines. Obviously, digital maturity of surveyed markets differs, and CSD provides results by country. 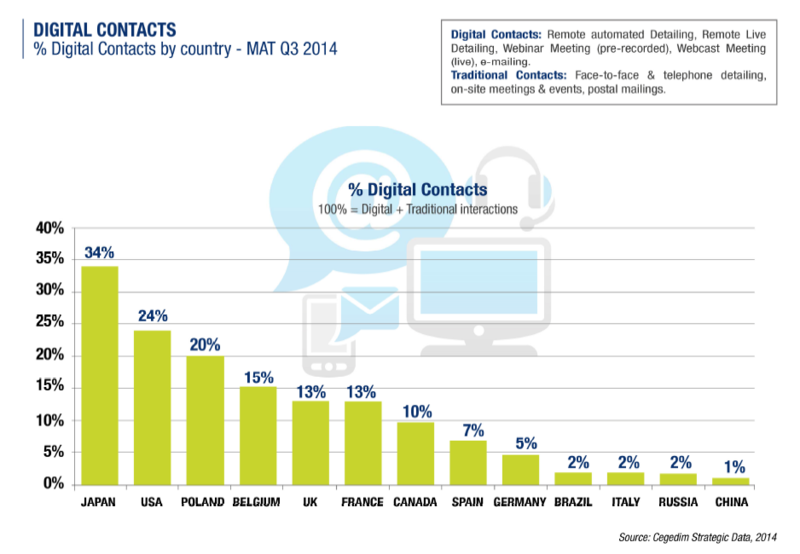 Even in the most advanced Japan, only 34% of contacts is classified as digital. For USA it is 24%, Poland 20%. Other countries have much lower proportion of digital interaction – Germany 5%, Brazil, Italy and Russia 2%, China just 1%. This has to skew results. We do not know the size of the sample of German or Chinese HCPs, but even if it is 100 doctors per country, we cannot say anything relevant about impact of any factor that affected only few respondents in the group. From CSD data, we can see that in 11 of 13 markets, a predominant channel of digital interaction with HCPs is emailing. This again puts digital in unfavorable light. Does an e-mail from sales rep counts as an interaction with HCP? Can we reasonably expect that e-mail alone will change HCPs decision for prescriptions? We should not, and this brings another surprise. The most positive impact of digital interaction on prescription is declared in Canada where 55.6% of digital interactions led to positive intention to start or increase prescribing promoted brand. The most skeptical towards the digital were doctors from France, still 17.1% of those declared positive impacts. CSD says that in every country impact of traditional interaction with HCPs was higher than for digital. But what are we comparing here? It is an email campaign versus face to face and telephone detailing, on-site meeting or event, delivery of printed materials. Those results mean that HCPs should receive a proper, multi-channel campaign that combines e-mail (automated with marketing automation tools), remote detailing, on-site events supported with webcasts, websites that allow rich interaction and include order form for additional materials in print or in automated detailing. CSD’s story is that their result shows a need for more of traditional approach. This is simply impossible due to market environment. But it would not be smart either. What we read from the data is that emailing alone can bring 20 to 50% impact on prescription, so pharmaceutical marketing job is to invest more in multichannel approach.